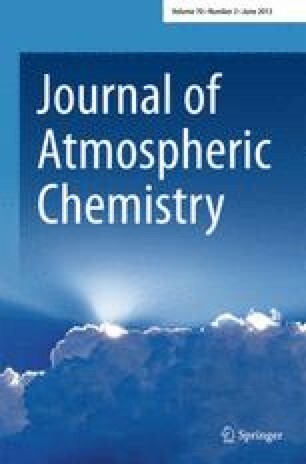 Airborne measurements of acetone were performed overthe tropical rainforest in Surinam(2°–7° N, 54°–58° W, 0–12 kmaltitude) during the LBA-CLAIRE campaign in March1998, using a novel proton transfer reaction massspectrometer (PTR-MS) that enables the on-linemonitoring of volatile organic compounds (VOC) with ahigher proton affinity than water. The measuredacetone volume mixing ratios ranged from ∼0.1 nmol/molup to ∼8 nmol/mol with an overall average of 2.6nmol/mol and a standard deviation of 1.0 nmol/mol. Theobserved altitude profile and correlations with CO,acetonitrile, propane and wind direction are discussedwith respect to potential acetone sources. No linearcorrelation between acetone and CO mixing ratios wasobserved, at variance with results of previousmeasurement campaigns. The mean acetone/CO ratio(0.022) was substantially higher than typical valuesfound before. The abundance of acetone appears to beinfluenced, but not dominated, by biomass burning,thus suggesting large emissions of acetone and/oracetone precursors, such as possibly 2-propanol, fromliving plants or decaying litter in the rainforest.